Please read this diet plan many times to understand it fully. I have tried to keep this document short, but it is packed with information. This diet is much more refined than the original nutritional balancing diet used by Dr. Paul Eck, and it works much better. DEVELOPMENT. If you don’t know about this, please read Food And Development and Special Foods For Development. Development is a secret of nutritional balancing. MINERALS. I find that everyone is mineral-starved today, thanks to modern agricultural practices, stress and eating refined food. Eating piles of cooked vegetables is the only way I know to obtain the nutrients everyone needs. DIGESTION. Most people have weak digestion. This diet rests the intestinal tract and soothes it. PURITY. Over 3000 chemicals are permitted in food, and many of these can damage health. This is a clean diet. YANG. Yang means warm and more compact. Today it also means much healthier, as well. For more on this topic, please read Yin And Yang Healing on this site. The following are listed roughly in the order of their importance. Importance of the Diet. Diet is extremely important for development and nutritional balancing. Proportions of Various Foods. Eating at least 70% cooked vegetables with each meal is extremely important. Types of foods. Eat cooked vegetables with every meal. Eat animal protein (lamb, chicken, turkey, sardines, or eggs) ONLY ONCE OR TWICE daily, and only 4-5 ounce servings for an adult. Never eat red meat more than 3 times per week. Avoid all wheat, all fruit and all sugars. Dairy products (cheese, yogurt and milk) and beef are optional, only, and not important. Food Combinations. Keeping meals simple with only two or even just one type of food at a meal is important. Quantity of Food. The portion size must vary with a person’s age, height and lifestyle. We allow more food, as long as the percentages and types of food are correct. Eating Habits. This is important, such as not drinking water with meals, eating slowly, and chewing thoroughly. Quality of Foods. This is somewhat important, but not as critical. Organically grown is superior, but not required if you cannot find it or cannot afford it. Food from fast food restaurants is of much poorer quality and not recommended at all. Avoid Yin Foods. This is critical today! Avoid all fruit, all juices except for up to 10 ounces of carrot juice daily. Also avoid nightshade vegetables, all raw vegetables, most fermented foods except a little yogurt, kefer, sauerkraut and miso. Avoid rice cakes and have only a little olive oil. Also avoid all refined food, all food powders, smoothies, soups, food bars and most processed foods. Blue corn tortilla chips are good, however. A. Mono meals, or one type of food per meal. For example, you could have a few cooked vegetables for breakfast. A few hours later have a can of sardines. A few hours later have some more cooked vegetables. A few hours later have a small bowl of oatmeal or 1/3 of a bag of blue corn chips. A few hours later have another portion of cooked vegetables. Mono meals are the easiest to digest, and this is why they are excellent. You may need to eat 4 or 5 meals daily if they are mono meals. B. The other way to eat is to have two types of food at a meal. 2) EITHER ONE protein or ONE starch. This is also for ease of digestion. a) Do not mix meat and eggs at one meal, as these are both proteins. Also, do not mix rice and corn tortillas at the same meal, as these are both starches. b) Do not mix a oatmeal with eggs (mixing a starch and a protein). For example, you may have a large amount of two or three cooked vegetables with a chicken thigh. Then, a few hours later, have a cooked vegetable or two with a starch such as blue corn tortillas or quinoa. Also, if possible, refrain from putting a lot of dressings, sauces, relishes, sweeteners and spices on your food. A little is fine to flavor the food. Too much can upset digestion. 2. Eat At Least Three Meals Daily. Do NOT Skip Meals. If you are not hungry, still try to eat at least three meals daily. It is difficult enough to obtain enough nutrients eating three meals daily. It is even less possible if you skip meals. Eat by the clock, if needed. Do not wait until you are hungry, as some suggest. Rotate your foods. Do not eat the same food several times daily or every day. 4. You may have more than three meals daily, but do not snack all day, as this is hard on digestion. Instead, if hungry, eat another small sit-down, relaxed meal. 5. You may eat plenty, provided it is the right foods in the right proportions. The right proportions for this diet are listed above. 6. Try to find fresh and organically grown food, although organically grown is not required. Organically grown food is generally higher in nutrients and lower in pesticides. Fresh food is generally better than frozen or canned, although even canned vegetables are definitely better than no vegetables or eating junk food. The only reason not to eat fresh food is if it is old or spoiled. 7. Eat only whole, natural foods. This means: NO protein powders, NO green drinks, smoothies or shakes, NO juices except 10 ounces of carrot juice away from meals, NO eggs whites only or Egg Beaters, and NO food bars. See the references below for the reasons for these restrictions. Eat slowly, chew thoroughly, sit down when eating, and eat in a relaxed, quiet environment. Ideally, rest a few minutes before your meals, and rest at least 10 minutes after each meal. Avoid eating while driving, when upset, or in noisy places. Ideally, cook once a day. You may have one day of leftovers. It is not necessary to cook for every meal. 70% well-cooked, not raw vegetables. References: Organically Grown Food, Flawed Studies Of Organic Food, Genetically Modified Food, Food Faddism, Food Basics, Smoothies, Soups, Purees And Juices. ​Remember, have 5 to 7 of these vegetables with each meal. CLICK HERE FOR FOODS TO EAT ON A DAILY. 2. Quantity: Adults need to eat about 3 cups of cooked vegetables at each meal, at least three times daily. This means 7 to 9 cups of cooked vegetables daily. This is the most important and most difficult part of this diet for most people. Fill two-thirds of your plate with cooked vegetables! Measure the cups with cooked, not raw vegetables. 3. How Many at a Meal. You can have one, two or three different cooked vegetables per meal. 4. Which Also, please avoid sprouts. Most contain a toxin to protect the young plant. Also avoid sprouted breads, spouted nut or seed butters, and other sprouted products. A. Root vegetables parsnips, turnips, beets, burdock root, horseradish root, celery root, or black radish, potato, and yams. A little garlic or ginger are good for flavoring. B. Cruciferous vegetables green cabbage or broccoli. C. Greens All greens are foods for occasional use - no more than 1 to 2 times a week. Spinach, carrot tops, beet greens, peas, cilantro, mustard greens, Chinese cabbage, Napa cabbage, bok choy, Swiss chard, kale and green onions. Always cook greens. Raw vegetables are too yin and the minerals in raw vegetables are difficult to absorb. You can have on occasion (once a week) a salad. Try not to make it a habit however. D. Other acceptable vegetables you can eat on occasion up to twice a week, though not quite as good, are fresh corn, winter squashes (acorn, spaghetti and butternut squashes) and okra. Also, please avoid Sprouts. Most contain a toxin to protect the young plant. Also avoid sprouted breads, spouted nut or seed butters, and other sprouted products. 5. Vegetables to Avoid. Do not eat nightshade vegetables (white and red potatoes, tomatoes, all peppers and eggplant). These vegetables are really fruits. They are too yin, and somewhat toxic due to their solanin content. Also, avoid or have rarely asparagus, artichoke, cucumber, jicama, and summer squashes such as zucchini or sunburst squash. These are slightly toxic or yin. All squashes and pumpkin are fruits, so they are more yin. Avoid yuca, taro root, breadfruit, burdock root, cassava, horseradish root, anise fennel, radicchio, rapini, kohlrabi, and parsley root. These vegetables are all either too yin or a little toxic. 6. Cooking Vegetables. The vegetables should be cooked until soft, NOT RAW OR CRUNCHY. Pressure-cooking is best – fastest best-tasting, and easy to clean up. Other acceptable methods are steaming, crock pots, or stir-frying. Do not use microwave ovens. A little roasting or barbeque is okay, but do not deep-fry, roast or barbeque all food. These methods use high heat that generates some toxic chemicals. A. It greatly enhances the absorption of minerals from food. This is most important. B. It makes the food more yang, which is very important. C. It kills many bacteria and parasites on vegetables. D. It concentrates some foods, allowing one to eat more of the food. E. Cooking reduces the amount of several vitamins in the food. However, it does not damage the mineral content of food at all, and this is far more important, in almost all cases. 6. Variety. Please eat a variety of cooked vegetables, not just two or three all day. 7. Freshness and Leftovers. You can cook once daily, preferably in a crock pot or steamer, or you can even cook for two days. I do not suggest eating leftovers for more than one extra day. 8. Frozen and Canned Vegetables. Some frozen vegetables are okay, but fresh is best, so do not eat all frozen vegetables. Canned vegetables are usually not as good, but they are much better than not eating vegetables, if this is all you will eat. 9. Salads and Cole Slaw. Raw vegetables do not provide many minerals, and are much more yin. They are not necessary. For these reasons, they do not count as eating vegetables. Please do not eat many salads. One a week is fine, but do not make it a habit please. 10. Sprouts. The only sprouts allowed are mung bean sprouts. These must be cooked. 1. Quantity. About fifteen protein foods are allowed on this diet: Lamb, chicken, turkey, egg, sardines, roasted almond butter, roasted tahini (or roasted sesame butter or some hummus). Less desirable but okay in moderation are raw cheese, yogurt, kefir (up to 4 ounces of all dairy per day), duck, quail, pheasant, and beans such as lentils. Wild game is okay, except for buffalo and bison, which are not as good. 2. How often. Eat protein three times daily. This does not mean one needs to have protein with three meals a day. One could have protein with two meals, and also have a snack of protein. This could be leftover chicken, one or two eggs, almond butter, sardines or a piece of cheese. Have animal protein only twice daily. Eat red meat only 2 or 3 times per week. 3. Fresh. Preferably eat all meats fresh, not frozen. Avoid sausages, turkey bacon, all pig products, bratwurst, hot dogs, bologna, salami and other processed meats, even all-natural ones. Most of them contain added chemicals. 4. Portion size. Portions of protein foods for most adults should be 4 to 5 ounces only. Slow oxidizers should have about 15% of their diet as protein. Never eat red meat more than 3 times per week. 5. Cooking. Cook all protein foods. The exceptions are cheese, yogurt or kefir, and these should be eaten raw. Crock pots, steaming, and stir-frying are good cooking methods. Do not overcook meats. Cook them no longer than 1 hour, generally. An exception is cooking a whole turkey or other large piece of meat. Roasting (such as barbeque) and baking are not quite as good. Do this only occasionally. 6. Lamb. This is an excellent meat that is almost always pasture-raised, even from the supermarket. Eat two portions each week. It is the best red meat, and an excellent and special food for development. 7. Sardines. This is an excellent protein food. It contains plenty of RNA, DNA, selenium, omega-3 fatty acids and vitamin D, along with an excellent quality protein. Most sardines are wild-caught, and cooked when very fresh. Ideally, eat three to four cans weekly, but no more due to the mercury in all fish. Any brand of sardines is okay, but Atlantic Ocean sardines may be a little lower in mercury. Skinless and boneless sardines have half as much mercury in them. 8. Wild Game. Elk, deer, and other wild animal meat is good. Avoid bison and buffalo. For some reason, these are not quite as good. 9. Beef. This is a hybridized food today, and not needed at all. If you wish, eat only one serving per week or less. 10. Eggs. Men can have up to 8 eggs per week. Women can have up to 6 eggs per week. Eating more eggs than this causes liver toxicity and is harmful. Always eat eggs soft-cooked, with the yolks runny. This means either soft-boiled, poached, lightly fried or mushy scrambled. Avoid hard-boiled eggs, quiche and other hard-cooked eggs such as omelets and egg sandwiches. 11. Dairy. Ideally, find raw dairy products. Organic is also better than most standard dairy. Have a total of only 4 ounces of dairy products daily or less each day. It is not an essential food. 12. Nut and Seed Butters. Have about 1 tablespoon daily of roasted almond butter (NOT almonds). The butter is much easier to digest. ​Occasional use of other nut butters is okay. However, all are too yin and somewhat difficult to digest. AVOID all nuts and seeds. 13. Dried Beans (legumes). These are somewhat yin. You may have up to two servings per week. Green or brown lentils are best. 14. Protein Powders and Smoothies. Avoid all of these! They are 1) often horrible food combinations 2) too much water mixed with the food, which impairs digestion, 3) too yin (raw, broken apart and liquidy are all yin qualities) , 4) generally contain much less nutrition than the whole food, and 5) are often eaten in a hurry, rather than cooked, and chewed thoroughly for proper absorption. 15. Avoid all Vegetarian Diets. These are too yin and deficient in vital nutrients. Vegan diets are the worst. 16. Fish and Seafood. Sadly, all fish, other than tiny ones such as sardines, contain too much mercury to be eaten. Also, only have 3-4 cans of sardines weekly for this reason. If desired, once a week you may have a portion of anchovies, herring, or smelt. These are tiny fish, so they contain less mercury. Seafood or shellfish are usually even more contaminated with mercury and other toxins than fish. Please avoid all shrimp, crab, lobster, scallops, oysters, octopus, calamari, eel and perhaps other seafood. 17. Bone Broth. For now, do not use bone broth. Recently we found too much lead in bone broth. 1. Blue Organic Corn. This is one of the best carbohydrate foods for development. The most common way to eat them is in the form of blue corn tortilla chips. We do not find the vegetable oil used to make the corn chips to be a problem, even canola oil. Occasionally, one can find good blue corn tortillas. We do not recommend buying blue corn flour, as it is not fresh enough. We do not recommend buying blue corn flour, as it is not fresh enough. Slow oxidizers may have about 2 bags of blue corn tortilla chips per week, assuming that a bag contains about 9 ounces or about 250 grams each. 2. Other Grains. These are not working as well for development. Fast oxidizers should skip them or eat them only occasionally, or if you do not handle blue corn very well. They include oats, rye, barley, rice, wild rice, quinoa, millet, and amaranth. Other starches are sweet potatoes and yams. These are technically vegetables, but are digested more like starches. They are okay for occasional use, but I do not recommend them more than once a week. Do not eat white or red potatoes, which are nightshade family vegetables. 3. AVOID all wheat, kamut, einkorn and buckwheat at this time, please. They are more irritating to the intestinal tract. Particularly avoid all products made with white flour. This includes cakes, cookies, pastries, breads, muffins, flour tortillas, hot and cold cereals, soups thickened with flour, and white flour wheat pasta. Pasta made of rice, corn, or quinoa are better, but is not highly recommended. Eat the only occasionally. 4. Cooking. Blue corn chips are very convenient.If you eat other grains, always cook them thoroughly. Avoid all raw grains such as granola, trail mix or some raw grain cereals such a muesli. Do not soak grains before cooking them. It makes them more yin. 5. Food Combining. Do not mix heavy starch with protein at the same meal. Also, do not have more than one starch at a meal. Also, do not put milk, nut or seed milks, or any liquids on cereals such as oatmeal or millet. This dilutes the intestinal juices. It is best to eat cereals dry, or perhaps with a little butter on them. 6. Rice Cakes. Avoid rice cakes, which are a highly processed and less nutritious food. 7. Breads. Avoid all wheat bread, even organic whole wheat bread or multi-grain bread. Bread is a more damaged food because it is cooked at high temperature for an extended period of time. A little gluten-free bread is fair if you feel you must have it. 1. Quantity. The slow oxidizer eating plan is a lower-fat diet. If a person in slow oxidation eats foods with fat in them, which is desirable, then do not add any extra fat to your food. For example, if you eat dark meat chicken (preferred), lamb, eggs, sardines, almond butter, blue corn chips and some cheese, yogurt or a little beef, then do not add extra fat to your diet. This is the ideal way to obtain your fats. 2. The Best Fats: Fatty meats such as dark meat chicken, dark meat turkey, lamb, and fatty cuts of beef. Roasted almond butter also contains an excellent oil. Other good fats are egg yolk, and raw or organic dairy products such as cream, butter, full-fat yogurt or cream cheese. Butter is better than ghee for most people because it is less processed. Only have ghee if you cannot use butter. The Challenge brand of butter in America, found at supermarkets andWalmart, is an excellent brand of butter, even better than some organic health store brands. 3. Vegetable Oils. Occasional use of refined vegetable oil is okay, such as peanut, sunflower, safflower, sesame, corn, soy, and canola oils. Vegetable oils in blue corn chips are okay. Less recommended are unrefined flax, hemp, or other less processed oils. The problem is these go rancid quickly - even in the refrigerator, where they must be kept. 4. Fruit Oils. These are too yin for everyday use. They include coconut oil, palm oil, and oily foods such as avocado. It also includes olive oil, although a little is fine. 5. Avoid Deep-Fried Foods. Avoid deep-fried foods such as French fries because the oils are often damaged. 6. Avoid All Krill Oil, Primrose Oil, and Borage Oil. These are slightly toxic. Also avoid margarine, shortening, bacon, lard and other butter substitutes. Also avoid processed and canned meats that often contain oxidized fats. 7. If You are Very Concerned About Cholesterol: Cholesterol will normalize on a development program, in almost all cases, without the need for dietary fat restriction. If you are very afraid of cholesterol, begin with less meat, eggs and butter. Instead, to supply fat, have more olive oil and roasted almond butter. 1. The Only Allowable Fruit. The only acceptable fruits on this diet are up to 4 olives per week. The best olives are the black botija olives, as they are more yang. 2. AVOID all Other Fruit. Fruit today is hybridized, too yin, upsets blood sugar and digestion, and is not needed at all. Fruit also absorbs a lot of toxic potassium if the trees are fertilized with N-P-K fertilizers. This fertilizer is used even on organic fruit orchards. 3. AVOID all Other Simple Carbohydrates. This includes sugar, honey, maple syrup, agave syrup, fruit concentrates and rice syrup. 4. Artificial Sweeteners. Avoid artificial sweeteners such as Aspartame, Equal, Splenda, Saccharin and others. If you must use a little sweetener, stevia or xylitol are among the best. 1. Quantity. Adults need to drink three quarts or three liters of water daily. An excellent habit is to drink up to 1 quart of healthful spring water upon arising in the morning. 2. Do Not Drink With Meals. Drink an hour after meals up until 10 minutes before a meal. 3. The Best Drinking Water. The best is usually spring water. You can buy it in plastic bottles or visit www.FindASpring.com for local sources. European: Evian, Iceland Springs, Icelandic, Evamor, Aqua Panna,Volvic, Voss (and not the others). American: Crystal Geyser, Ozarka, Moutain Valley, Sno, Resource, Simply Sedona, Walmart, Trader Joe’s, Whole Foods (365), Alaskan Spring, Kona Deep, Sprouts, and Alpine Pure. Canadian: Ice Age Glacial spring water, Canadian Springs, Artesian Springs (B.C. ), Salt Spring Island Water, (B.C). Asian/Pacific: Fiji, Hawaiian Springs, Waikea, Ka-Vita, Eternal (from New Zealand). Second best is usually carbon-only filtered tap water. (Use carbon, carbon block or a sand filter only for filtering water. Do not use multi-stage filters as they seem to damage the water). 4. Water to Avoid. AVOID reverse osmosis water, also called “purified water” or “drinking water”. Also avoid alkaline waters, or other designer waters. Well water may or may not be pure. 5. DO NOT Add Minerals or Salt to Your Drinking Water. 6. Other Beverages. Do not substitute other beverages for the water. They do not hydrate the body well enough. However, you may have one cup of coffee or one cup of black or white tea, or mild herb tea daily. Do not drink green tea, as it is more yin and does not agree with some people. 7. Milks. Limit cows or goat milk to no more than four ounces daily. Milk should be organic and if possible, raw. Avoid soy milk, rice milk, almond milk, and hemp milk. These are not as nutritious and are more yin. 9. Juices. 10 ounces of carrot juice daily or 1-2 ounces of wheat grass juice daily are okay. NO other juices. NO V-8 juice and NO Juice Boxes. Have carrot juice 15 minutes before a meal or between meals, as it does not combine well with meals. Use a juicer, and not a blender such as the Vitamix to make carrot juice. Blenders do not break up the carrots enough to extract all the nutrients. They also mix the juice with too much water and air, which is not desirable. Also, they leave the pulp intact, which is not desirable in this case. Those with yeast problems or sugar sensitivity may not tolerate carrot juice well. In this case, try drinking one half or one-third of your juice. Put the rest in the refrigerator and drink more of it every few hours. This avoids putting a lot of sugar into your blood stream at one time. 10. Fruit Juices and Kombucha Tea. AVOID both of these! Kombucha tea contains a harmful amphetamine-like substance. 11. Sugary Beverages and Alcohol. Completely avoid soda pop, all sugary drinks such as lemonade, Kool-aid, Gatorade, Recharge, energy drinks, and alcohol. Wine is one of the most contaminated alcoholic beverages today. The only ones allowed are sauerkraut, miso, yogurt, kefir and cheeses. In addition, a little tofu and tempeh are okay, but are not the highest quality foods and are best avoided. Other fermented foods are too yin, and many of them contain aldehydes. Particularly avoid kombucha tea. Note: Add sea salt and spices to your cooking preferably after cooking is done. This is for several reasons, including that some spices are best eaten raw, rather than cooked. 1. Sea Salt. This is very necessary as a source of minerals. Real Salt by Redmond is an excellent brand, and there are others. AVOID TABLE SALT, which is refined and often has added aluminum or other poisons in it. Also AVOID Himalayan or Himalayan Pink salt, which are too high in aluminum. 2. Tarragon. This is good, especially for those with a four lows pattern. Organic is not needed. 3. Others. Better herbs are garlic, ginger, mustard, dill turmeric, dried cilantro, curry powder, cumin, burdock, horse radish, oregano, basil, rosemary, thyme, marjoram, and parsley. 4. AVOID table salt, black pepper, and very hot spices although a little cayenne pepper is okay. Also, avoid most other herbs, especially Oriental herbs, which tend to be somewhat toxic. Other Foods to Avoid. Avoid most prepared and processed foods. Instead, make your own simple dishes. Also, avoid most frozen prepared meals, as most contain many chemical ingredients. Read labels if you are not sure. Some frozen meals are okay, but not many. Restaurants are a problem, unless you know the food is made freshly and not laced with hundreds of chemicals and also some restaurant do not have high standards of cleanliness. You can look for ethnic restaurants such as Chinese, Thai, and East Indian that use a lot of cooked vegetables but always use discernment. Chain restaurants are often the worst, in terms of cutting corners. Avoid the common fast food restaurants, as their food is generally of low quality. All pig products (ham, pork, bacon, and lard). All soy products, except miso and a little tamari or natural soy sauce. Soy products to avoid include soy milk, soy protein powders, Hamburger Helper, textured vegetable protein or TVP, tofu, tempeh and others. All algae, including spirulina, chlorella and others. All protein powders and meal replacements. All hard-cooked eggs, such as hard-boiled eggs, quiche and omelets. All processed meats, organ meats and American cheese or “cheese food”. Most prepared and processed foods. Instead, make or purchase your own simple dishes. Frozen prepared meals, as most contain many chemical ingredients. Read labels if you are not sure. A few frozen meals are okay, but not many. 1. Choices. Always give children choices (all good choices) about their food. It is a form of honoring the child. I know it is more work, at times, but it is helpful. 2. Inclusiveness. If possible, include the child in shopping for and preparing their food. This is usually better than just serving meals, no matter how beautiful they are. 3. Set an Example. Parents need to follow the diet, as well. This can help a lot with feeding children. You can struggle together with the turnips, making faces and holding your nose, if needed. It is difficult to ask a child to eat a lot of vegetables, for example, if you don’t do the same. 4. Have Fun and Relax. Don’t be too serious, too rigid, or too forceful about the diet. Smile a lot, play with the food, a little, be creative and at peace with the diet. If you try to force any diet on a child, it will often backfire and cause tremendous anger and resentment. 5. Negotiate. This means to explain gently to a child that you, the parent, love your child and therefore want your child to eat properly. If the child will go along, then you are prepared to reward the child with various gifts, privileges, outings, food, etc. The rewards depend on the age and nature of the child. It could be a movie, buying a present, or it could be a slice of pizza once a week, or a piece of chocolate or a cookie once a week. If the child decides not to go along, then there must be consequences. You must follow through with the consequences, even if they are draconian such as taking away the computer, the television time, the movies, or the car for a teen. If you don’t follow through, negotiation won’t work at all. Working this way with children is excellent for their growth and development into mature adults. However, the arrangement needs to be crystal clear, and you must follow through exactly on what you say you will do. It is much better than forcing children to eat certain foods or to avoid certain foods. Negotiation is work for the parent, so be prepared and hopefully parents are on the program, so they will have the energy and understanding to do this. 6. Experiment. The above is general. There are many ways to assist a child to eat better. For example, begin with just a little of a new food, and use toppings and food combinations, if needed, to make the food more palatable. 7. Cream for Young Ones. If it will help, add a little fresh, heavy cream to many foods for young children. Most love cream, and most need the fat. 8. Patience. When parenting, there is no substitute for patience. Some say it is the essence of love. Children are all learning, so they will make mistakes, listen to the wrong people, and have strange ideas, at times. Remember, your child does not know much about nutritional balancing, has his or her own likes and dislikes, and is influenced by others, as well. 9. Never Give Up. This is always interpreted as a sign that you don’t love your child, so don’t give up. Just change tactics or strategy. If you don’t like plain vegetables or other parts of this diet, you may add toppings for flavor. These can include a little butter, cream, whipped cream, salt, garlic, cayenne or mustard powder, soy sauce, salad dressings, almond sauce (almond butter and a little water mixed together), pesto sauce, or chili sauce. Read How To Disguise More Vegetables In Your Diet for many other vegetable suggestions. Avoid these, if possible. They are usually lower quality foods. Insist that genetically modified foods be labeled so people can know what they are eating. Shop for vegetables and meats at least once a week. These shopping trips do not have to take a long time. Ideally, visit the stores when they are not crowded, and when they have plenty of choices. If you have many errands to do besides food shopping, shop for food last so the food will stay cold and fresh. An alternative is to carry an insulated cooler in the trunk of the car in which to place items that need to stay cold to remain fresh. These include vegetables, meats, butter, eggs and other dairy products. I find that the following groups of people are starving: those that skip a meal, vegetarians, especially vegans, raw food eaters, salad eaters, junk food or processed food eaters, nibblers (those who don’t eat much), and those who eat at fast food restaurants. Pressure-cooking vegetables, grains, meats and legumes is superb. For details, read Pressure-Cooking. Steaming and crock pots are other good cooking methods too. Use glass, enamel, or stainless steel cookware. Steamers can be plastic, as well. Do not cook meats for hours. One hour should be sufficient, in most cases. Baking, frying and barbequing are okay on occasion. However, they are not as good because the high heat produces harmful chemicals. Avoid exposed aluminum cookware and microwave ovens. Microwave ovens seem to damage the food more than standard cooking methods. Making the simple effort to nurture yourself by preparing healthy meals is very important for healing and maintaining health. Most of this diet is about habit, and the habits are easy once you get used to the routine. Eat regular, relaxed, sit-down meals. If possible, eat only one or two foods at each meal. This simplifies digestion greatly. Eat slowly and consciously, and chew thoroughly. Chewing each mouthful at least 15-20 times will assure better digestion. Keep the conversation pleasant during meals. Do not criticize children or discuss very negative topics at meal times. Make your meals a pleasant activity. Stop eating before you feel stuffed. Also, sit for at least ten minutes after you finish eating, or if possible, take a short nap or siesta after eating. Avoid eating in the car, while standing up, while on the phone or while rushing around. These habits impair digestion and reduce the value of the food. Also avoid drinking most liquids with meals, as this tends to dilute the digestive juices. Drink up to 15 minutes before meals and one hour or more after meals. As a general rule, do not snack between meals or at night. It is usually not needed, at all. Have some spring water or a cup of tea while watching television in the evening if you are tempted to snack. If your blood sugar is unstable, you may need a snack or preferably a small meal in between your main meals. This snack should contain some fat and perhaps a little protein. Examples are a soft-boiled egg, some raw goat cheese, a little leftover meat, a little all-natural turkey jerky, or a little roasted almond butter on a few rice crackers. Another snack is a few blue corn tortilla chips. If blood sugar is very unstable, you may need five or six small meals per day for a few months or so, until your health improves. 1. Cleanliness. Make sure the restaurant looks clean. This is a major problem with some restaurants. 2. Cooked Vegetables. Be sure the restaurant serves enough well-cooked vegetables. Ask to look at a menu before you sit down if you are not sure about this. Ethnic Oriental restaurants are often excellent places to find cooked vegetables, such as East Indian and Chinese. Thai restaurants may not cook the food sufficiently, and they use a lot of coconut oil and peanut products. 3. Peace and Quiet. Make sure there is a quiet area in which to sit. Stay away from noisy tables, smoke and blaring televisions or music. 4. Televisions and Music. Ask that music be turned down if it is loud. 5. Ask for what you want. For example, often you will need to ask for triple portions of cooked vegetables. Most restaurants will be happy to comply. 6. Bread and Salad. If these are served, ask that they be taken away. 7. Raw Food. Never eat raw food at restaurants for cleanliness reasons! 8. Water. Bring your own water or order spring water. 9. Supplements. Bring your supplements along, or swallow them in the car before you enter the restaurant. 10. Fast Food. Fast food chain restaurants are often the worst, in terms of cutting corners, chemicals hidden in the food, use of microwave ovens, and other “food insults” that lower the quality of the food. 11. Bring or Cook Your Own Food. When traveling, consider staying at a condominium with a small kitchenette. Today, many hotel rooms have refrigerators, and you can set up an electric food steamer and make some of your own meals. Bring food along in the car, or when you arrive at your destination, find a market and stock up for the trip. This will often save a lot of money and time, and you will get what you want without hassles. For much more about eating while traveling, read the articles below. 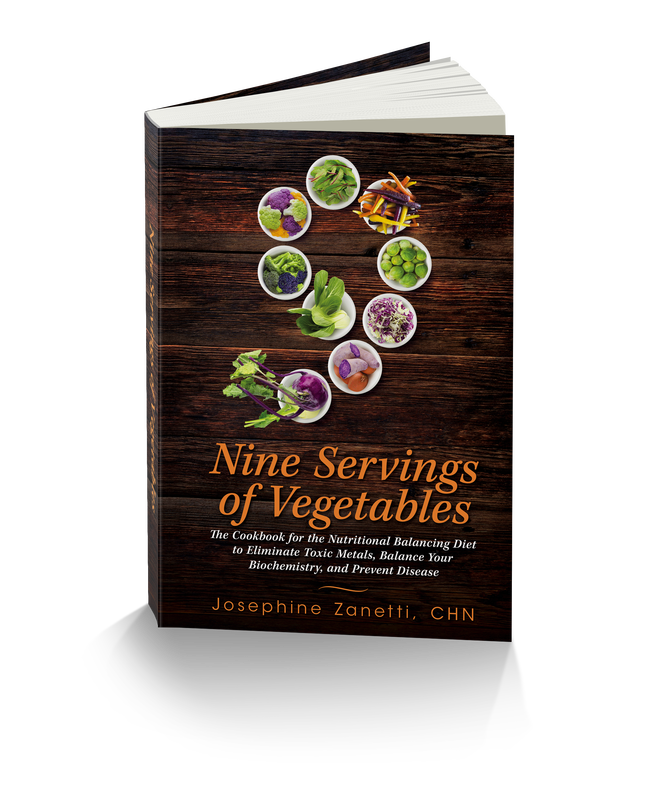 If you want more variety in your diet, when starting the program, or find you are getting bored with your meals, order Nine Servings of Vegetables: A cookbook for the Nutritional Balancing Diet, to Eliminate toxic Metals, Balance your Biochemistry and Prevent Disease.